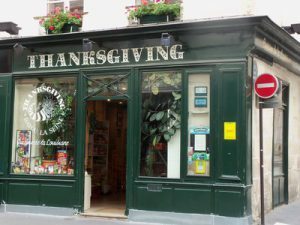 And a Marais boutique named, appropriately enough, Thanksgiving is the only one-stop shop in all of Paris — perhaps even all of France — to purchase everything needed to cook turkey, stuffing, cranberry sauce, green bean casserole, yams topped with marshmallows and, of course, pumpkin pie. Or, we should say was the only such shop in the City of Light. The venerable boutique shuttered permanently a few months ago, the victim of the sale of the building hosting the shop to new owners that plan to create a luxury hotel on the site. Dear Customers, we had pleasure to receive you in our Thanksgiving store and it is not without some emotion that we announce you the closing. Thank you for your loyalty and your smiles! An exceptional hotel will soon open at 20 Rue Saint Paul ,Hotel Charles V.
It’s a sad day for all Americans in Paris. A sad, sad day, indeed. Nope, there’s no turkey. No stuffing. No candied yams. No cranberry sauce. No pumpkin pie. 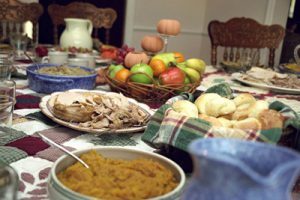 No, Thanksgiving is very much an American holiday, and with the exception of a few restaurants catering to U.S. tourists that offer a Thanksgiving Day meal, the holiday is virtually ignored in the City of Light. In fact, the ingredients for a traditional Thanksgiving dinner are nearly impossible to come by in Paris. Turkey? It’s not a common bird offered in Parisian butcheries (you’re much, much more likely to find pigeon or quail than turkey). Cranberry sauce, or even cranberries for that matter? Good luck. Cream of mushroom soup and fried onions for green bean casserole? Like looking for a needle in a haystack. 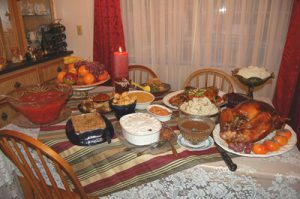 So, what do expats do when they want to cook up a big Turkey Day feast with all the trimmings? Or those visitors to Paris who are lucky enough to be in a rental apartment and who wish to prepare a scaled-down version of the grand holiday dinner? Those in the know head to Thanksgiving, a delightfully quirky Marais shop specializing in American foodstuffs. Opened on—of all coincidences—July 4, 1990, by American ex-pat Judith Bluysen and her French husband, Thanksgiving offers the most complete selection of American food and culinary products in all of France. From bagels made in New York City to Heinz ketchup and from Kraft macaroni and cheese to Skippy peanut butter, Thanksgiving is truly a one-stop shop for those craving a taste of the U.S.
And the boutique stocks all of the ingredients needed to prepare a complete Thanksgiving dinner, including ready-to-stuff turkeys and premade pumpkin and pecan pies. But one doesn’t need to visit Thanksgiving only if preparing the holiday meal of the same name. If you’re in Paris for any length of time, you probably will begin to miss familiar foods from home. This is especially true if you’re staying in a rental apartment and plan to do at least some cooking on your own. Sure, you should probably concentrate on preparing French cuisine, but if you’ve got kids who insist on peanut butter and jelly sandwiches for lunch or pancakes with maple syrup for breakfast, Thanksgiving should be one of your first stops in the City of Light. Or perhaps you’re in town just for a few days and you’re hankering for a Dr. Pepper (try finding that anywhere in Paris), Reese’s peanut butter cups, Doritos or even just a pack of Juicy Fruit gum? There’s all this and more at Thanksgiving. First, it’s impossible for any boutique to carry every American food product available so the more unusual the item you’re looking for the less likely you are to find it at Thanksgiving. And two, beware of sticker shock. No, that box of mac and cheese won’t cost the same 99 cents you might pay for it at home. Everything sold at Thanksgiving needs to be imported from the Untied States, and the shopkeepers need to make a profit to stay in business on top of that, so expect inflated prices. 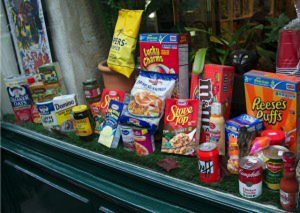 Just pay them, because you won’t find a similar array of American foods anywhere else in France. 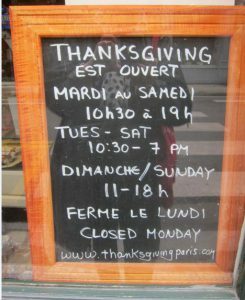 This entry was posted in American Products in Paris, Marais, Shopping and tagged Thanksgiving, Thanksgiving boutique, Thanksgiving in Paris by Bob Adams. Bookmark the permalink.